Hans’ early childhood was spent in an orphanage, apprenticing with a gardener for which he was never paid. In 1924, Hans wrote to his father who had moved to the U.S. and begged for his help. Six months afterward, he also immigrated to America and found work in the furniture factory where his father was employed. During his first year there he attended night classes at Copper Union, winning first prize ($20 gold coin) for period decoration. The following year, 1927, Burkhardt enrolled full time at Grand Central School of Art at 42nd Street. This was a pivotal point in Burkhardt’s early work because it was here that he met his life-long friend and mentor Arshille Gorky. Burkhardt was in Gorky’s life drawing class and learned about Cubism, Cezanne, Miro and "how to put paint on". He also attended private classes on Saturdays at Gorky’s studio. In 1939, Burkhardt held his first one-man show at the Stendhal Gallery in Los Angeles, set up by the artist Lorser Feitelson. After his move out West, Burkhardt never returned permanently to New York and would no longer be recognized by the East Coast. Throughout the ‘50s and ‘60s, Burkhardt lived in virtual isolation from the prominent art world of New York and Europe. At this point his work became more reflective of current political strife, in particular the Spanish Civil War. In 1944 Burkhardt showed "War – Agony of Death" at the Circle Gallery, where it was attacked by a woman with a cane. His original interest in war and death was reinvented into the theme of tragic isolation in life. The final realization of his ideas emerged in his skull paintings, begun in the 1960s. A new aesthetic of beauty arose though the surface drama of skulls in his collage work used to literalize the power of gesture. The morbidity of the relief work reveals density with physiognomic power. 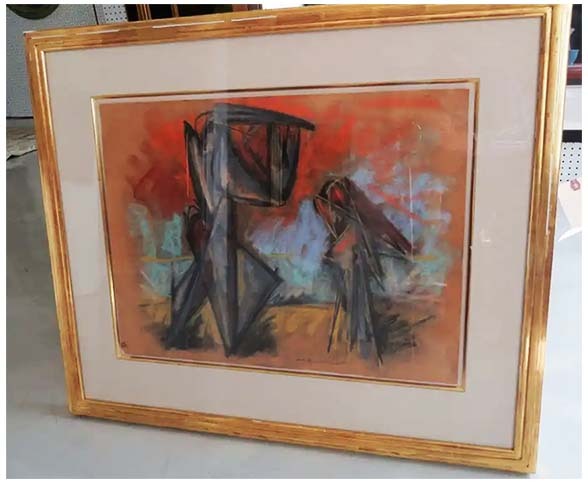 Surprised by Gorky’s death in 1948, Burkhardt paints three versions of "The Burial of Gorky" in the following two years, which are then shown at the Metropolitan Museum in New York City. 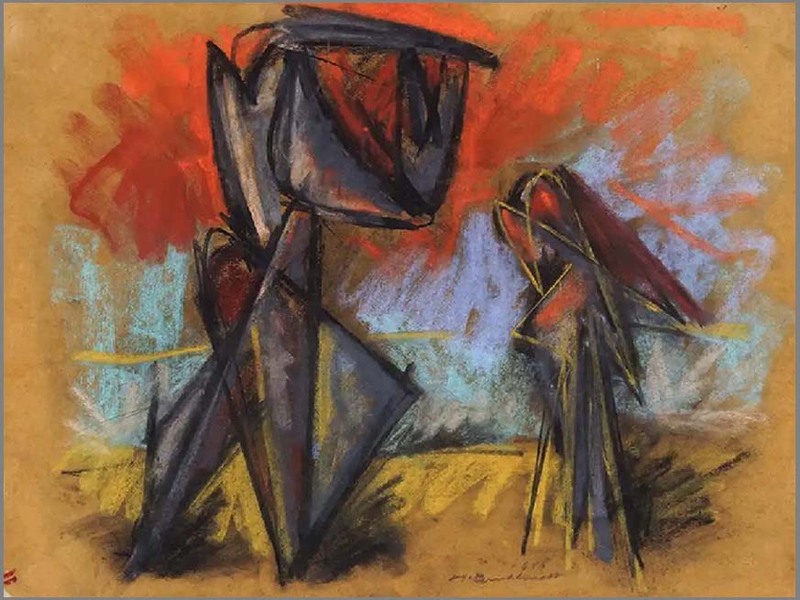 He later exhibited "The Studio of Gorky" at the Whitney Museum of American Art (NYC) and received strong critical acclaim. However, he rejected several offers of representation from galleries in New York, preferring to exhibit on his own. 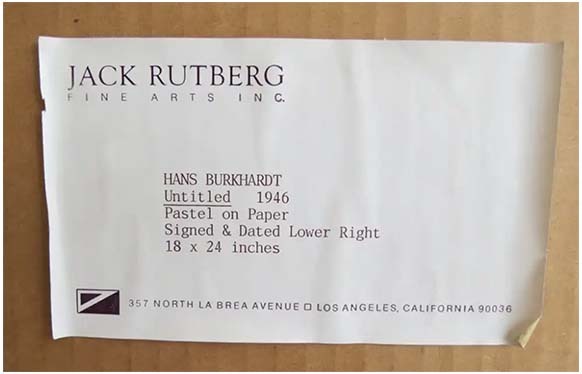 Burkhardt remained quite active as he took on a full time position teaching at the University of Southern California in 1959, three years after a 10 year retrospective at the Pasadena Art Museum. "Last Judgment, Dark Shadows – The Burial of my Enemies" was completed in 1966 and was Burkhardt’s first time using actual skulls in his paintings. His work evolved around themes of trying to break away from regiment and hope for peace. Another painting revolving around World War II, entitled "Horror Never Happens Again", shows a circular border or arms and hands around an iridescent figure which represents protection and safety. Burkhardt was highly praised for his mature work both in ArtNews and by critic Hilton Kramer in The New York Times. By the 1980s, Burkhardt’s work had reached its fullest potential, turning from images of imbalance to tragedy. As the post-painterly Abstract Expressionist artists sought to expel this tragedy, Burkhardt embraced it. He continues to live and work in California while making occasional trips to Guadalajara, Mexico. Burkhardt’s delve into the depths of human tragedy produces beauty and understanding unparalleled in Post-Modern art.